Cover is slightly warped, small stain on front cover. Inside pages are nice and clean. 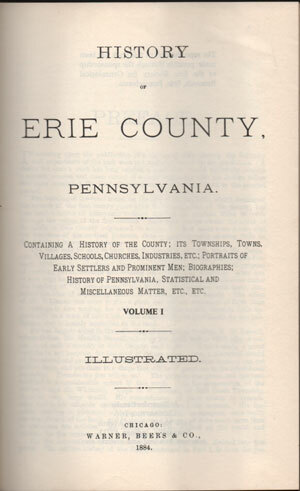 Originally published in 1884 by Warner, Beers & Co., this is a 1976 reprint by Unigraphic, Inc.
Loaded with history starting from the earliest settlement of Erie County, Pennsylvania up to 1891. Includes a large number of family biographies. Hardbound, thick volume with 1006 pages plus 81 page index. Note that this volume one only.